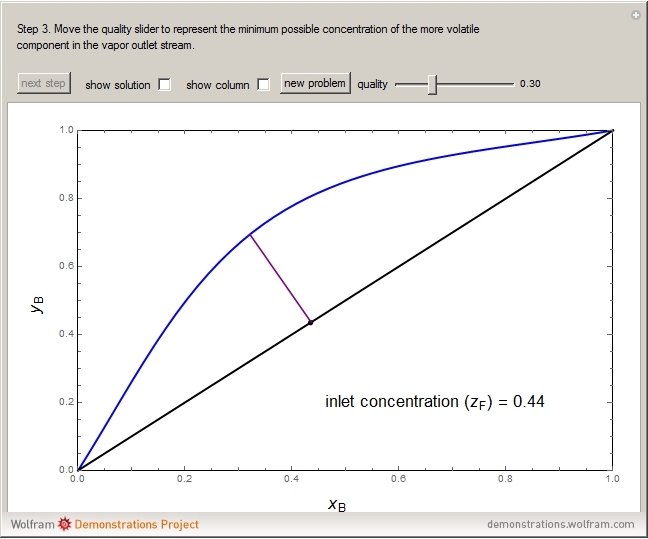 This Demonstration leads you through a step-by-step procedure to generate an - graph for a binary vapor-liquid equilibrium and then determines outlet compositions for a flash distillation column. 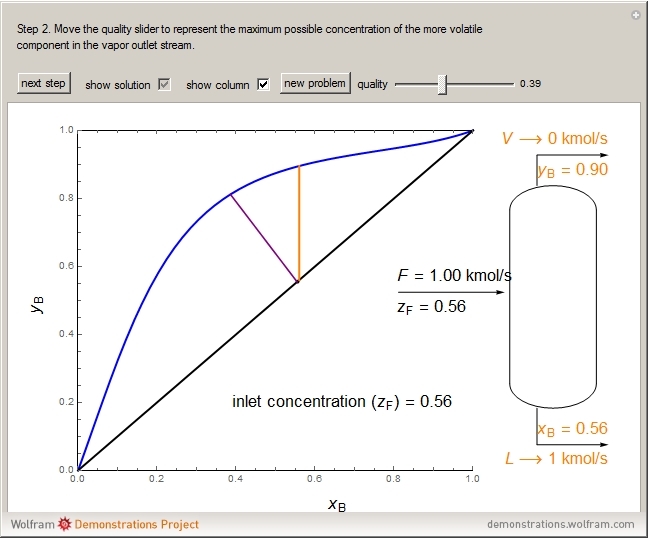 Points are moved using a locator on the graph or moving the slider to select the desired quality (defined here as vapor flow rate divided by feed flow rate). 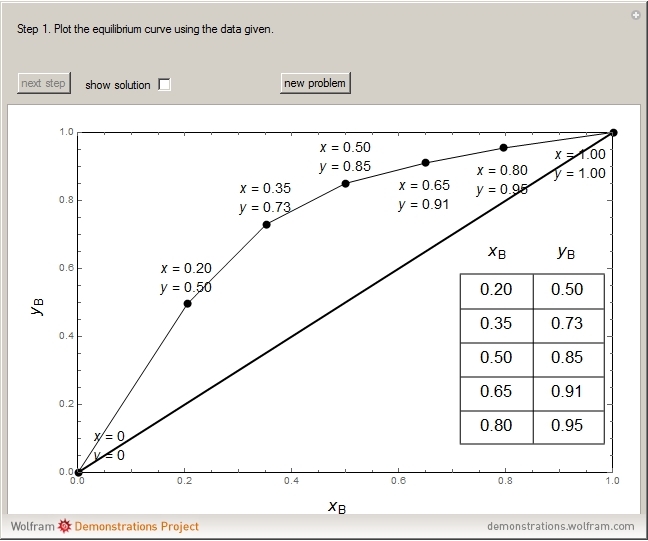 After each solution is ready, select "show solution" to see the correct solution and then select "next step". 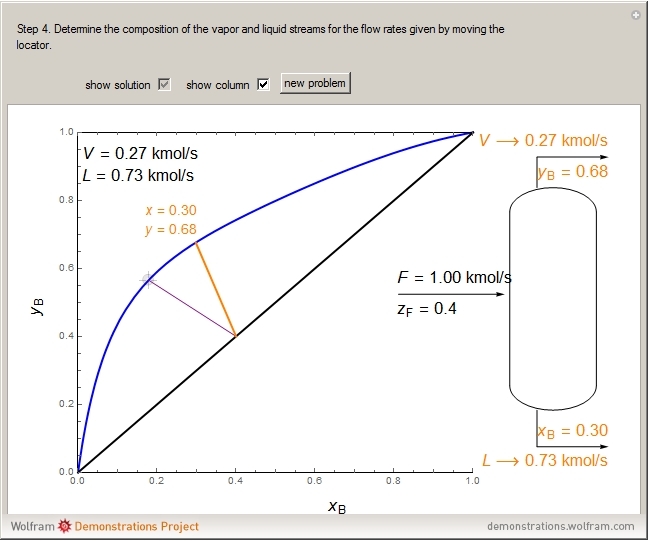 Selecting "show column" presents a representation of the column with flow rates and mole fractions (when "show solution" is selected). At any time, "new problem" can be clicked to generate a new set of values. Flash distillation (also known as flash evaporation) is steady-state, single-stage distillation. In this Demonstration, the liquid feed contains two components. An adiabatic throttle reduces the pressure and a fraction of the liquid feed evaporates to maintain constant enthalpy at the lower pressure. Phase equilibrium data at the outlet pressure helps determine the composition and flow rates of the outlet streams. The activity coefficients in this simulation are pseudorandom. where , and are the mole fractions of the more volatile component in the feed, bottoms (liquid) and distillate (vapor) streams, respectively. The flow rates ( , , ) are for the feed, bottoms and distillate, respectively. "Construct an x-y Diagram for Flash Distillation"